The timer is very easy to use and is controlled by a single button moderator control pendant. Put each of the three bars on a table for each team and then connect each bar to the back of the timer using a modular (telephone) cables. Connect the micro-USB cable from the 100C to the USB power supply and then plug the power supply into a wall outlet. The timer is very light-weight and the cables weigh more than the timer does so a book or a piece of gaffer’s tape on the cables may prevent the timer from sliding around. The connection to the 100C is standard USB so as an alternative to the wall mounted power supply, you can also power the timer with a USB battery pack or laptop's USB port. 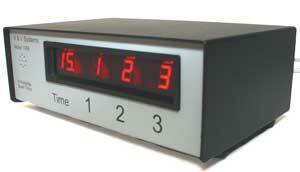 The front panel display has five digits - a two digit time display on the left and three team displays to the right. On the left most two digits, a value between 1 (low level of noise) and 3 (severe noise). On the three team digits, a value between 1 (low level of noise) and 9 (severe noise) to assist the moderator in determining the source of the interference. 1 4 1 1 – low level interference likely near bar "A". 3 4 5 9 – severe interference likely near bar "C". After checking for noise, checks that the team bars are properly connected. u – (lower case U) – the timer measurement indicates that the bar is unplugged. L – (upper case L) – the timer measurement indicates that the cable to the bar is too long.
. – (decimal point) – the timer measurement indicates the bar is connected correctly.
. u u L – The timer is ready and detects that team A and B are unplugged and team C cable is too long. . . . . – The timer is ready and detects that all the team's bars are properly connected. When the timer is idle, a single click will start the five second countdown timer. If no team is waiting to answer, stop the clock. Note that if a second or third team has not yet buzzed in, they can still buzz in and the clock will restart and flash their place digit. A press and hold will clear both the clock and place displays and is ready for the next question. The 100C timer is continually improving and each software version adds new features and services. To determine the software version, press and hold the moderator control button when powering up the timer. The software version will be displayed on the front panel display for five seconds before continuing on with the normal power up process. When reporting any troubles, please include the version along with any other symptoms.